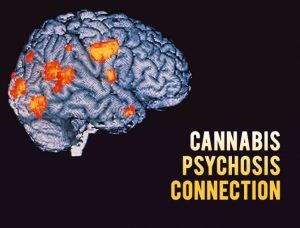 Cannabis psychosis connection. As Canada prepares to legalise cannabis, there are concerns about its connection with psychosis. Experts are trying to work out how best to educate people about the mental health risks of using cannabis. In the case of Anita Smith, she had never used cannabis until she went to film school. There was no mental illness in her background. She used it daily for two years and constantly heard voices. In fact, she had an alternate reality where she was an A list actress in demand in Hollywood. She was the only one of her group to have this reaction to cannabis. She was later diagnosed with schizophrenia in a British Columbia Hospital. Danish research found a connection between developing schizophrenia and bi polar and heavy cannabis use. Almost 50 percent of people hospitalised with psychosis triggered by cannabis were later diagnosed with bi polar or schizophrenia. Experts believe that the younger a person starts using cannabis the higher the risk. But they do not know if it just triggers the first psychotic episode or whether it actually causes them. According to a 2014 report, hospitalisation for cannabis related disorders in youth increased. The increase was 44 percent for young people between the age of 15 and 24. This connection between cannabis a psychosis is not new. Recently the Schizophrenia Society of Canada received $83,000 from Health Canada to explore this further. Because cannabis is a natural plant people believe it poses no mental health risks. But there is a link between psychosis and cannabis in particular for young people. Cannabis is a natural plant with many health benefits, so people believe there are no mental health risks. Psychosis is when someone experiences an impairment of their thoughts and emotions that is not relevant to reality. These can be hallucinations, delusion and believing these are true. Research shows cannabis can cause temporary psychotic breaks in susceptible people. This can increase the risk them developing a psychotic disorder later in life. At particular risk are youth as their brains are still developing. The prefrontal cortex is one of the last parts of the brain to mature. This is the part of the brain that affects social behaviour, personality and decision making. It does not fully mature until the mid-20s. Using natural or synthetic cannabis can disrupt normal brain development. This can put youth at higher risk of developing psychotic conditions later in life depending on their level of cannabis use. While it is thought cannabis is not the cause of psychosis, researchers believe it can be a trigger. The risks of adverse effects from cannabis are higher for young people than in adults because their brains are still developing. One in six young people using cannabis will become dependent. There is an association between depression and using cannabis in young people but experts are not sure what the relationship is between the two. Cannabis can cause psychosis in young people even when there is no history of previous mental illness. While the risk is low, it increases by 40 percent with the heavy use of cannabis. Cannabis can affect academic performance. Schizophrenia Society of Canada CEO Chris Summerville said cannabis can exacerbate the risks of a psychotic episode for people who already have a mental illness. He warns people need to make informed decisions as using cannabis can lead to schizophrenia. THC affects a person’s neurotransmitters and receptors in the brain. This can cause depression, thoughts of suicide and anxiety in some people. He said the problem is people do not understand how cannabis can affect them. Summerville expresses concern Canada is not prepared for changes in cannabis laws. He said there was not enough public information available. People needed to understand the risks to mental to make good choices. Last year a Toronto lawyer from a well-known family attacked a family with a baseball bat. His lawyer said the incident occurred while in the grips of a psychosis incident caused by cannabis. Summerville said more people may suffer psychotic episodes without the information they need before it becomes legal. He said education is important and worries that those most at risk may not get the information they need before the laws change.